A lot of childhood days out with my Dad had class 56s in them. We used to go to Doncaster and Barnetby in the mid-nineties (trips across the Pennines were a couple of years away!) and the scream of their turbo chargers as they accelerated. Considering how much of a part of the railway they were, it seems odd how they no longer an everyday sight. 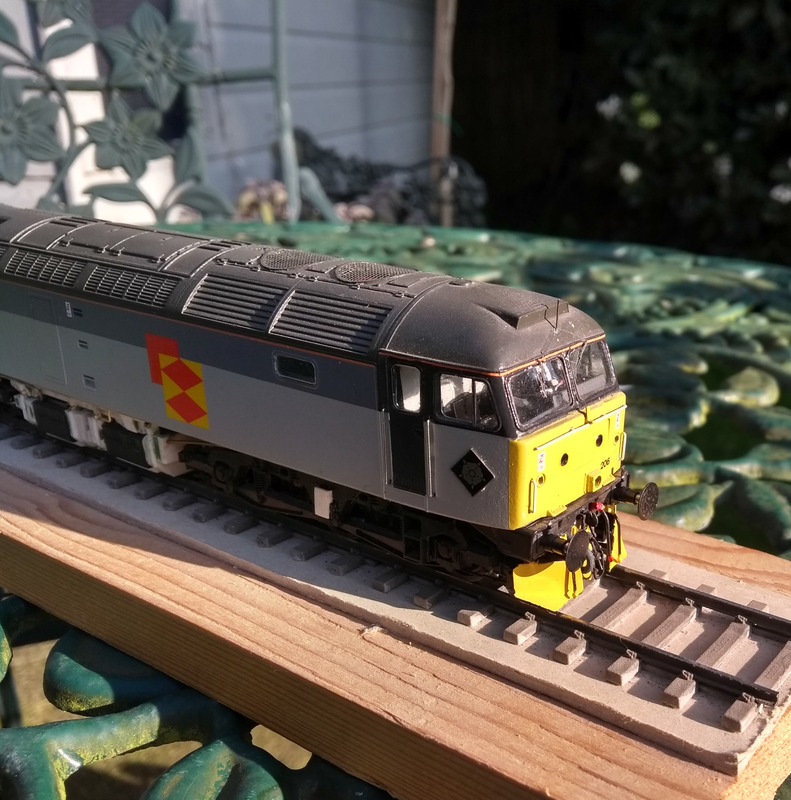 Around this time, I can remember the class 56 my Dad came home with (over twenty years ago!) 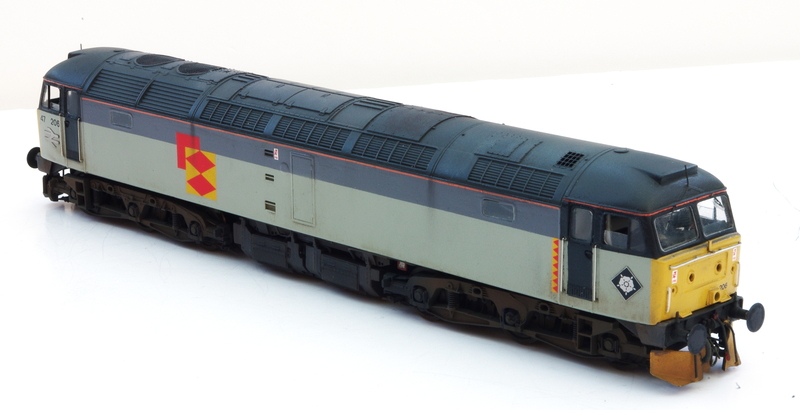 from the local model shop; a Dapol model, repainted by its previous owner in Railfreight Construction livery. While the repaint might not stand up today, it had a real impact with the ten year old me. The triple grey colours were exactly what I was seeing when we went out watching trains. Class 56, no. 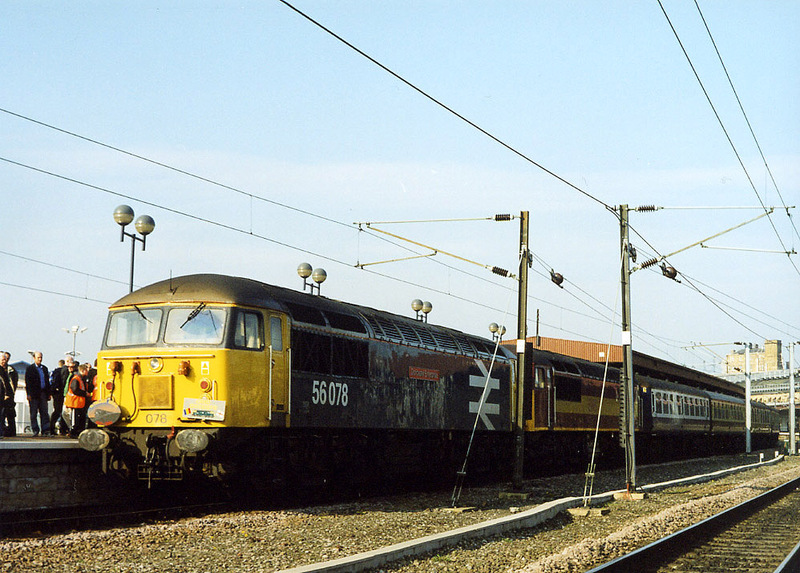 56067, passing through Barnetby around 1993 I think. Taken on a Fuji 35mm ‘point and shoot’ camera with a very short pre-set lens in fading light. Not great quality but as it was a ten year me who took it, it seems very appropriate here. I’m not exactly old at thirty four, but I am now modelling the railways “of my youth”. With that I do sound old… West Halton is firmly set in the early nineties – it’ll always be summer and the my nine year old self would have been oblivious to the issues the line and its staff would be suffering. The railways were not in the best shape then after years of under investment; the branch to West Halton, and the steelworks it served, would struggle to last a few more years. While West Halton Sidings is, of course, fictitious this story was true of a good number of freight only lines. During these times, the clean and bright appearance of many of the ‘triple grey’ locos really made them stand out. Whilst I may have over romanticised this a bit, although they looked clean, the railway’s always been a filthy place! But it does lead me neatly to the latest loco to join the West Halton fleet, an early British built class 56 from Hornby. As it comes, it’s in Trainload Construction livery which upon opening the box did stir memories of the original 56 which my Dad brought home. Beyond the colours, the loco itself is good too. It’s not the first of the ‘new’ class 56s I’ve had from Hornby, I’ve got sitting on a shelf one of the original releases in EWS livery with the revised cantrail grilles. When I changed eras, the later style loco (thanks to the correctly revised grilles) just wasn’t suitable for the early nineties. I really should do something with it… But it does make an interesting comparison with the earlier style of loco. The difference between the cabs on the Rumanian and early British machine when compared with the later locos is significant yet very subtle. On the older Dapol model you could make this change by carefully ’rounding off’ the moulding. The early cabs were of aluminium and did have a ‘softer’ look than the later steel fabricated cabs. Capturing this is difficult, even when you take care – Hornby have captured the face of the loco well I think. The multiple working equipment is quite reasonable and is a key feature of the ‘face’ of the loco – the model features revised high intensity headlamps which certain locos acquired over time, more so towards the end of their working lives. Although the moulding is pretty nice, it doesn’t make it a little more awkward to renumber the loco to match other class members – a bit of work and the original style can, I hope, be retro fitted. As with Hornby’s other current generation diesel models, the cab interiors are superbly modelled. The standard of tooling on the roof is excellent – there’s a real delicacy to it which really places the model towards the top end of things. Moving away from the cabs the loco is very pleasing. The cantrail grilles are very delicately reproduced, as it much of the roof detail. The fan grilles, however, are just as I originally found and are a bit disappointing. The thickness of the body moulding is all too obvious – some years ago Hornby did much better with their class 50. However, Shawplan’s ‘Extreme’ etchings come to the rescue here. They also help with the covers for the jacking points, which Hornby have oddly missed. However, a couple of minor easily sorted details don’t really detract too much. The roof, fan grilles aside, is very good indeed it has the delicacy which we used to associate with Lima’s tool makers. Although we tend to look at the real thing from ground level, we view most models from above. Even with a high baseboard/tack level, we still look down slightly, so this area is very important. Fifteen years ago most of us began by detailing diesels by fitting new roof fan grilles to help matters on older models! One of the best parts of the class 56 is the underframe! It’s an area where Hornby seem to really go to town. The parts are delicate and vulnerable to rough handling, but surely we can cope with this, can’t we? If other manufacturers could follow Hornby’s league (and they’ve being doing this sort of thing for nearly ten years!) I would be very happy! 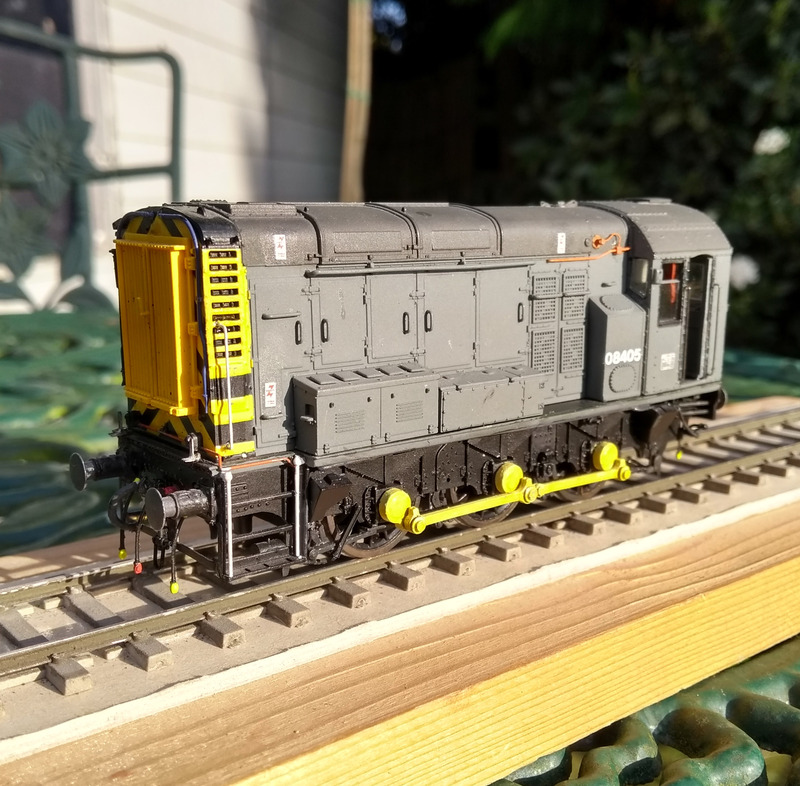 The underframe has some superb details which really is at the top end of RTR models – even seven years after the model’s introduction it still stands up. Much like Hornby’s class class 60, the fuel tank area is awash with separately applied details which are a world away from what went before. I spent hours rebuilding the underframe on my class 25 but the standard here is probably better than that! Is this depressing? Well, probably not but it’s a good indication of the standard here! The bogies are nice too – photos don’t really do them justice in their naked plastic state. The separate pipework for the brake actuators is a very satisfying touch and the cab steps are nicely rendered too. The bufferbeam suffers slightly as the chassis casting is to suit all three variations of the type, so there’s room for added detail beneath the one part of the buffer beam fairing which the early British built machines had – only the Rumanian built locos and 56031/2 had the full class 47 style fairing. The side detail cast into the chassis makes up for this and, being honest, from ‘normal viewing angles’ it’s not really a problem – that and most people aren’t as awkward as I am! Buffers are not perfect – they look a little underfed to me. Modified Hornby class 50 buffers would probably be worthwhile. The bogies are very nice – photos don’t really do them justice. Separate brake gear is mostly hidden behind the sideframes (although once repositioned for P4 I think they’ll be easier to see) but careful weathering will really bring this area to life. The overall appearance is very good – the delicacy of the body and finesse of the underframe really do make the model. Looking back I do wonder if I have appeared rather critical of the model – and I think I was probably overly critical of the original model I described back in 2007. I think it is more a reflection of the standard which we have come to expect of RTR models from the likes of Hornby. I’m also coming from the point of view of someone who likes to take out of the box models and improve them – I want this to not be, in this case, a Hornby class 56, but my model of a class 56. Small difference but quite significant. However, to make it a worthwhile proposition the starting point needs to be good in the first place. Hornby’s class 56 is a pretty good starting point. For most modellers, as it comes it is very acceptable; despite the list of extras and new parts I have in mind the model could easily be at home hauling a long rake of HAA hoppers and really look the part. As a ‘layout loco’ it works perfectly. And a base for a full on finescale conversion, it’s a very good place to start.